China property market came to the limelight again when the Chinese government announced stricter regulations for the property market in mid April which were similar to the regulations back in pre-crisis levels in Sept 07. 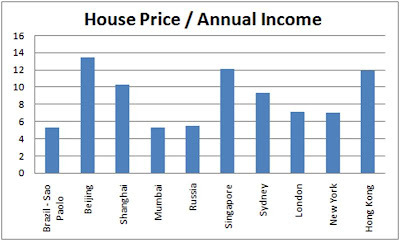 The announcement was made after Housing Price Index (HPI - Based on 70 major cities in China) continued to rise by 11.7% y-o-y in Mar 2010. On month-to-month basis, HPI retreated for the first two months of this year before rising again in Mar 2010. The government's tightening measures early this year appeared unable to contain the rising property prices. 1. Deposit: Raised to 20%-30% for first time buyers and 40% for second buyers as opposed to 20% across the board. 2. Rise in minimum mortgage rate for second home from 85% to 110% of BLR (5.94%). 3. Greater efforts to deal with violations such as keeping unused land, hoarding properties and price rigging. What is actually the property market condition in China? On a national level, China doesn't appear to be excessive and is close to the average. (I think KL is somewhere along that line as well) The highest are Singapore and Hong Kong (Too expensive). However, on a closer look at the individual cities, Beijing topped the list while Shanghai was close to Singapore and Hong Kong. Based on this, actually the highish property prices are only concentrated on several cities like Beijing, Shanghai, Tianjin, Shenzhen and Guangzhou. Nonetheless, China is not just based on two or three cities unlike other countries like France or UK, but has about 160 cities which have more than 1 million population. Therefore, looking at China as a whole, China appear to be nowhere near bubble territory. 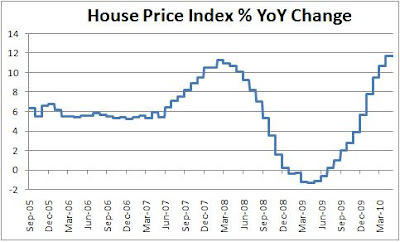 Surprisingly, affordability index has been on a downward trend with only a slight uptick expected in 2010. A lower affordability index indicates higher affordability. 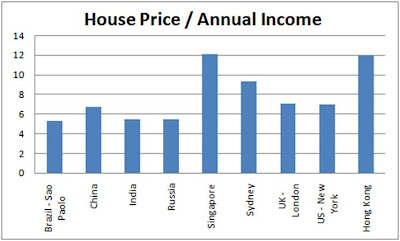 This was due to the higher growth in household income as compared to property prices. Nonetheless, rental yields are not painting a good picture on property prices. 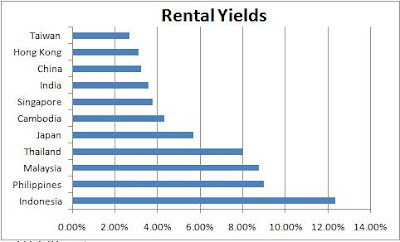 China's rental yield is only at 3.24% with Shanghai and Beijing dropping below 3%. The reason could be due to the loose monetary policies and regulations which encourage people to buy instead of renting. Such low rental yield might not be able to sustain the property prices. 1. Property sales will slowdown: Buyers might take a 'wait and see' approach to see how the government is tackling the issue and wait for property prices to drop. 2. Property prices might drop by 10-20%, but unlikely to fall below 30%. Most developers are sitting on strong cash position and limited supply, therefore not in a hurry to sell off their properties at lower prices. In addition, it is not the government's intention to lower the property prices but to quell speculation on property market. 3. Property market might turn to a buyer's market where supply exceeds demand in 2H2010. This is due to potential incoming supply of properties in 2H2010 as many projects were started in 2H2009. Usually, it takes 9-12 months lead time for projects to reach pre-sale condition. Many investors are worried of tightening measures by government which could hurt corporate earnings and slow down the economy. However, it is actually good that the government is making efforts to cool down the property market to prevent any asset bubble from forming especially in the top 5 cities, namely Beijing, Shanghai, Tianjin, Guangzhou and Shenzhen. Inflation for now is not really an issue as it is expected to be around 2-3% only with most of the inflation coming from food prices. On the other hand, there are worries that non-performing loans will surge on the back of possible property collapse which will cause a banking collapse. Non-performing loans might rise but will be cushioned by low leverage and high savings rate among China households and corporations. A banking collapse is also unlikely as domestic funding is largely controlled by the government and the government will not let bank runs to happen in China like what had happened in US and EU. This is in addition to Beijing's strong fiscal position to support the banking industry. Therefore, property prices could drop, but will not be severe. Government will continue to introduce further measures to cool down the property market which will cause volatility to the equity markets. Nonetheless, the measures undertaken by the government will be good for the sustainability of the property market and prevent any asset bubble burst.